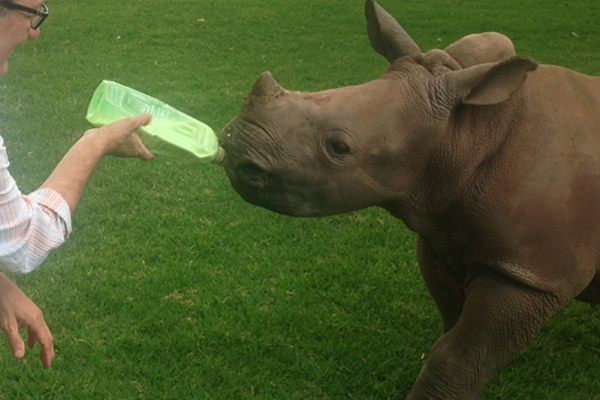 Baby Rhino Jenny at Baby Rhino Rescue | Adopt and Donate Now! Jenny was 3 months old when her mom was poached. The first 24 hours are critical for a baby rhino when the mother has been killed. If they are lucky to be found within that time, they are still hydrated , so they will be stronger. They have also not been exposed to the constant terror of suddenly being all alone. Jenny was one of these lucky baby rhinos. She was found within 12 hours of losing her mom so she came into RPF in good condition. But even though things were more straightforward for her, she still went through the terrible ordeal of having watched her mother brutally killed in front of her. She was then all alone, wandering the bush for hours. Suddenly there was a massive helicopter chasing her. One can imagine her complete terror as she crashed through the bush, all alone, doing everything to just escape before being darted. Imagine the terrible sensation of having a burning feeling take over your body, then waking up in a strange, new world. Everything about the new place would be terrifying: the odd smells, the sudden confinement, the presence of humans, and worst of all, the absence of your mom. This is a very difficult time for a baby rhino. For this reason Dr Pretorius puts baby rhinos who come in under these circumstances on anti-ulcer treatment for as much as 6 months. Not all rhinos are easy when they come in. But little Jenny was an adaptable rhino. Her blindfold came off within a day and she almost immediately started drinking milk, without even chasing the people feeding her! She is settled in very well and is a loving little rhino.